There are many companies present in the world that produce high quality home equipment such as tables, chairs, hoops and several other products that provides great comfort. Lifetime is one of these companies that promises to deliver a product with greater durability and affordability. The product is made of plastic and steel material, which promises superior quality and longevity. 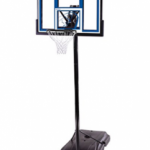 Just like these, basketball hoops by Lifetime are very well recognized and used around the world. This is due to the fact as they are very user-friendly and usually satisfies the user needs. Just like every Lifetime product, this company have a reputation of making a high quality solid product which is not only affordable, but can also be used for a very long time. 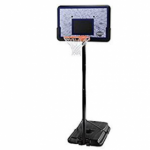 The Lifetime 71799 In-Ground Basketball Review system follows the policy of providing dozens of features and benefits in a very budget friendly price point. 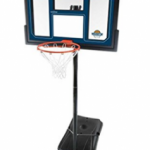 However, after looking the features of Lifetime 71799, there are some other products present in the market that are pretty much comparable to it, like the Spalding Pro Slam Basketball system and Lifetime 71525 Basketball hoop, which consist of the same price and have many same specifications just like 71799. 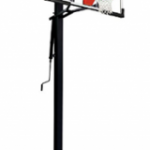 The Lifetime 71799 consist of a 50” steel covered unbreakable backboard having an action grip height adjustment procedure that comes in an adjustable range from 7.5 feet to 10 feet with an increment of six inch each. There is also a slam it rim and a nylon net which is ideal to be used in every weather condition, are included. The steel pole of the system comes in three pieces having a round 3.5” diameter. The 71799 height adjustable hoop by Lifetime is designed in such a way to give a permanent installation in ground. With extensive features like shatter proof backboard, grip pole and spring back rim, along with adjustable height system. The goal of the basketball is very strong which is fixed on cemented base, thus, it requires 72 hours for drying of the cement after installation. For setting up or adjusting the height, an action grip pole system is used which is one of the best features of Lifetime’s 71799, that makes this system accessible for beginners who wants to practice and work on their shooting skills. The adjustment can be done with six inch increment which is pretty enough for many beginners and amateurs, though there some systems that offers unlimited height increment which is really good, but are also expensive. 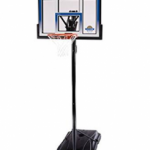 The 71799 Lifetime Basketball Hoop consist of a50-inch Shatter protective backboard which is made of Makrolon polycarbonate,hence making it unbreakable and stronger than acrylic. Thus, no need of additional backboard, once you set up this permanent basketball hoop. The backboard also have the ability to resist impact from other b-ball items. Though making it best for families and kids who consider a pretty much rough housing equipment and doesn’t like to treat the equipment with nobility. Therefore, the polycarbonate backboard doesn’t really matches the level and quality of tempered glass backboard which is featured on Spalding’s “The Beast” portable basketball Reviews system. The price tag of the system is mostly dependent on its backboard, the better the backboard the bigger the price. The board of Lifetime 71799 comes with a UV coating which prevents the board from not turning yellow when exposed through sunlight. With spring back rim and height adjustable procedure, makes the dunking and game play certainly next level. With action grip mechanism, players having different abilities and age group can enjoy the game. 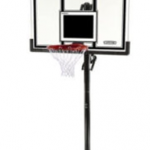 Lifetime 71799 consist of some features that makes this product pretty much superior than any other basketball system. 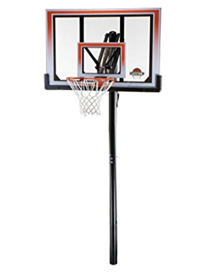 First is the rim of this hoop, which is constructed with high quality and consist of dual compression spring to handle shots and high intensity dunks. Covering with any type of corrosion resistant material hasn’t been done on these rim which will lead them towards rusting after some time. Therefore, the rim consist of dual compression spring which will protect your hands a lot while dunking and layups but it is not recommended to hang up with them, by considering they are traditional old-school rims and can withstand heavy load. Having a 50” steel framed unbreakable backboard gives this In-Ground system a superior look and feel of an international game. It is very easy to adjust the height with an Action grip adjustment procedure by using only one hand. The steel frame and pole are coated with rust resistant powder to make the system withstand every climatic condition. Have a heavy duty traditional looking rim with a nylon net that is suitable for every weather condition. Comes a five year manufacturer warranty. The steel pole of the system comes in three pieces having a round 3.5 inch diameter each. 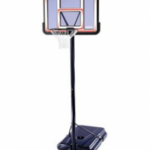 In my opinion, the 71799 Height Adjustable In-Ground Basketball System by Lifetime is the best hoop present in the world when it comes to affordability, durability and high quality construction. Let’s just start with how I assembled this system, first, I dug a hole 38” deep and 17” wide as said on the instruction manual which was found in the package and was pretty much understandable to me after reading it very carefully. Then using 12 eighty pounds concrete bags of concrete I filled up the hole by using assistance of my father who clutched the pole while I was filling. Then I let the cemented surface dry for the next 72 hours and right after that I found that the pole fitted in very firmly and rigidly. Then I climbed up the ladder while my father handed me the backboard which came in a very good large size and was immensely heavy. The quality of the board looked very impressive and sturdy. The Auto grip adjustment system worked really well, which made this whole system accessible for my 10 year old son who loves basketball Reviews 2017 . With a breakaway rim I can easily go for dunk shots without having a second though of damaging my hand. The backed up five years warranty really relived my stress over durability and after using this system I was pretty much sure that this hoop will serve me for very long time. The product is backed with five year construction warranty that shows how durable this product is. Action-grip pole makes the adjustment of height pretty easy and convenient for beginners who wants to practice their shooting skills. An extra support is provided with the dual compression spring on the rims. The hoop is very affordable with respect to their specifications. The system is constructed in USA. The top and middles pole does not fit in correctly. Assistance of at least three people are required while digging and In-grounding the pole. No support on backboard which leads towards extensive vibration of the whole system during high intensity shots. Height adjustment is only done in an increment of six inches, though it should be made infinite to meet international requirement. Pole needs to be greased and oiled regularly if want to remove it in future.